"1. Click the north up button to reset the view so that north is at the top of the screen. Click and drag the ring to rotate your view. 2. Use the Look joystick to look around from a single vantage point, as if you were turning your head. Click an arrow to look in that direction or continue to press down on the mouse button to change your view. After clicking an arrow, move the mouse around on the joystick to change the direction of motion. 3. Use the Move joystick to move your position from one place to another. Click an arrow to look in that direction or continue to press down on the mouse button to change your view. After clicking an arrow, move the mouse around on the joystick to change the direction of motion. 4. Use the zoom slider to zoom in or out (+ to zoom in, - to zoom out) or click the icons at the end of the slider. As you move closer to the ground, Google Earth swoops (tilts) to change your viewing angle to be parallel to the Earth's surface. You can turn off this automatic tilt (Tools > Options > Navigation > Navigation controls; Mac: Google Earth > Preferences > Navigation > Navigation controls)." You can now display the sun by enabling View > Sun or clicking on the sun button from the toolbar. To create time-lapse views of sunsets and sunrises, click on the "play" button and watch the changes. For some of the imagery, you can see at the bottom of the window an approximation of the date when it was taken. The Street View images from Google Maps are now available in a new Google Earth layer, which is not enabled by default. Google Earth includes much more models in the 3D buildings layer for cities like: San Francisco, Boston, Orlando, Munich, Zurich. "Google has optimized the loading and performance of 3D buildings. When you first turn on the 3D Buildings layer near a city with models, you'll see simplistic versions of the buildings load up really fast, then they gradually get more solid and load more texture detail," explains the unofficial Google Earth Blog. Google Earth 4.3 can be downloaded from earth.google.com. Windows users that don't want to install the application using Google Updater can try this direct link. You'll probably notice that the Windows setup is much smaller: the size has been reduced from 12.7 MB to 7.36 MB. Unfortunately, the new version seems to be less stable and it uses more resources, but it's still in beta. Seems really buggy to me. If I zoom in, it doesn't load any new textures, so I'm stuck with a really fuzzy image. It's pretty much unusable. They've also taken away the indication that it's "streaming". I'd hold off upgrading for a while. It works great to me. Fantastic! Better than the older version. Impressive... no more to say. Sooner or later, there will be Google Realtime Street View, which people will cheer for. Hold on, there will be then load of big brothers watching you. I wish Google Earth's mouse navigational commands were the same as NASA World Wind. Right click to change tilt angle seems so much easier than using the slider tool. This was because I was blocking ssl.google-analytics.com in my hosts file! I enabled Street View icon in Google Earth Layers but the icon still does not show up anywhere. I just downloaded the new version and I agree that it is not as good as the older one I had. When I try and zoom in on my house, it is MUCH fuzzier than in the old version. I also don't like the deletion of the "streaming" indicator because you can't tell if the image you are looking at is 100%. Anyone know if these can be fixed? If not, how do I get the old version back!! I can confirm too, as many have. This new version of GE doesn't load in more detailed textures. So no matter the zoom level, the images are fuzzy. AND the streaming indicator is gone. Homeland Security must have gotten a hold of their servers. I don't see an easy way to jump from street view to street view. 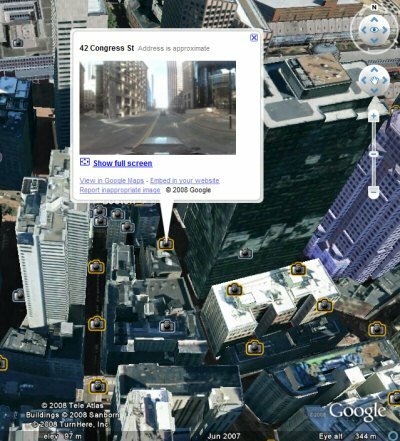 In the web version, when you are looking perpendicular to the street, you have left and right arrows to click on to quickly advance to another street view point. In the GE version you have to change your view so you can see the photo icons, then click on one, then change your view back. Is there a quick way, maybe a keyboard shortcut, to jump to adjacent street view photos? I would like the old mouse nav as an option. I feel like it's not as easy to move around. I want to tilt the earth myself. Realy goole earth very very nice any one in world. i site here see the streets find friends house street. so i am very to say google earth.thank you. good day readers....yeah i appreciate most in street view. How do you get street view on Google Earth Pro ?? Yea, right! Everyone thinks this is the greatest thing since sliced bread. Big Brother's watching! You know these street pictures are being taken by the FEDS. Confirmed this with a police officer. He stopped a suspicious unmarked white truck with a camera on the roof driving to slow. Confronted the driver and he confirmed he was with the FEDS taking these pictures and to "bug off". Google is just a front! google earth is good but i wish it would enable street view in other countries other than europe. were do you download it from guys ? ?